Oh man I wish I would have kept all the pictures over the years. I’ll just pick a recent one. This is from last week. The one on the right still running. Glad I wasn’t there to work on that. Wish I had pictures. 1968 kewanee, 200HP, no water treatment, lots of leaks, lots of make up water. Came with building my company purchased. Decommisioned 2015. Fixed the burner on this one last year. 109 years old. Not the oldest but maybe the ugliest. 1955 Kewanee-Ross, 1 million plus BTUH. Coal to NG conversion in late 60's. Was retubed maybe once, because of dry firing. Twice as big as needed today because of building improvements. 1919 zone is one pipe CI rads, 1954 zone is 2 pipe convectors. @RayWohlfarth I think I'm going to describe every leak I find as a "continuous blowdown"
looks pretty good it will probably go another 60 years people say old stuff is ng if it was ng it would have been gone years ago. 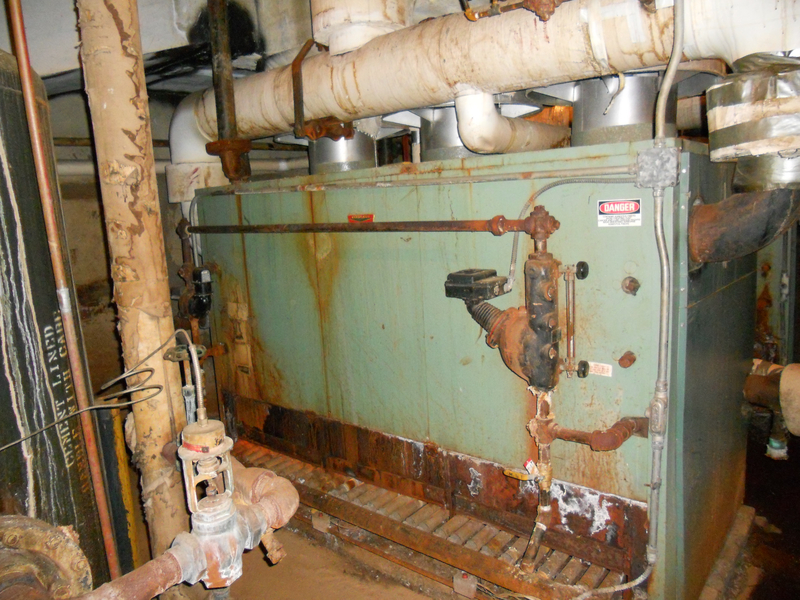 now we replace boilers that are 10-15 years old. 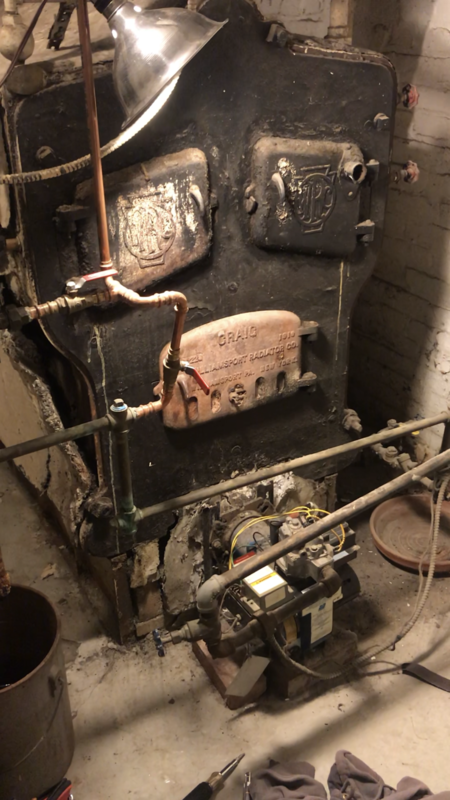 Not a boiler, but this is one of my favorite oldies, guy said he remembered when his father had it converted to oil when he was a kid and he would never replace it! Oh, if we're going there...Had this one replaced in parent's house last summer. Year over year oil reduction to date: 70% . The burner was not tuned properly until last week of February. Looking for 75% reduction in oil consumption next winter! I think you guys win the prize. Those furnaces are unbelievably inefficient. Stack temps run through the roof. Anyone still running one of those I feel bad for them. The old round coal boilers "pancake boilers" "snowman" or "robots" were bad too. 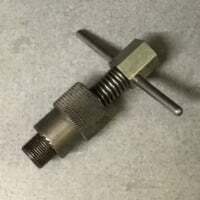 But with those you can usually put in a smaller nozzle and do some baffeling and improve the efficiency somewhat. I'll say they are inefficient. It is a nice thought to have simplicity but even nicer to get thru a winter using 625 gallons of oil as opposed to something north of 2300 gallons. My goal 500 gallons. @Jellis , I've owned two or three houses with those old gravity hot air furnaces in them. I replaced them with new forced air but I have to say those old units were built to outlast any home. The cast iron bowl and cap inside was over an inch thick and each half weighed over three hundred pounds. @Fred I couldn't find anything wrong with it, other than being inefficient and ugly. An abbatoire in the middle of nowhere. Steam scalds pigs and cleans premises. So no condensate return. Raw well water feed. Kewanee looked rusty but it raised steam twice a day five days a week.Was steel better in the olden days. Those old gravity hot air furnaces were good for one thing. I can't imagine where they would have mounted a blower or that you'd want the dust it produces all over the house/walls??? 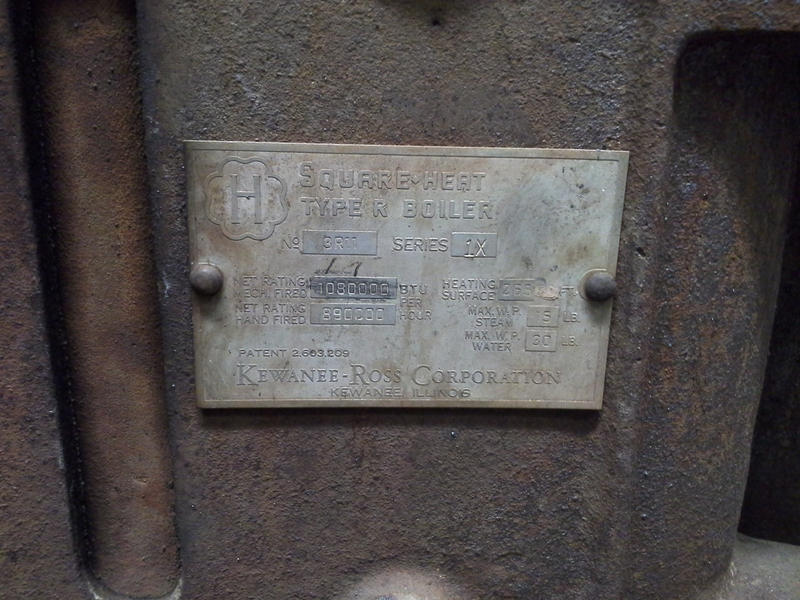 @RayWohlfarth The worst boiler that was still working that I ever saw was a forty year old small, oil fired steel new yorker. It was installed in 1977. Was original to the house. And was in the basement laundry room (Of course). The homeowner was told by at least three different contractors to replace it. The combustion chamber was intact but the heat exchanger and the baffles were all deformed and in some weird looking state of destruction. The whole boiler was leaning to the left. It had stains from many different past repairs on the jacket. Almost all of the insulation on it was gone. It was awful. Her excuse to not change it was because, and I quote. "But it's still working." She was a neighbor and friend of ours. It took insistence from me and our friends to finally get her to change it just two years ago. Wish I could find the pictures. @JUGHNE Now, THAT'S a boiler. It reminds me of a pot-bellied plumber. On the return side makes sense, I guess. Still seems like a dirty proposition. I can remember, as a kid, the dust/dirt those furnaces created. Every Spring my parents would buy a couple cans of what looked like play dough and we would take a baseball size hunk of it and roll it on the wall paper. It did a remarkable job of lifting the dust/dirt off of the wall paper. When we were done it looked like new. Part of the "Spring Cleaning" ritual. had a slant fin boiler I was asked to inspect for heavy usage. Found the owner had installed it himself, never removed it from the wood pallet which had broken. The taco 555 zone valves were wired 110 to the t-stats. the smoke pipe was run up to the area of the chimney thimble, and missed by 6". The chimney itself was an outside chimney strapped back to the house (hung out about two foot at the top). The oil tank was sitting about 4' in the air on rail road ties... and when i mentioned all the issues to the owner he called me a thief and said the oil was junk, that's why he used so much..
LOL can't make it up. I would love to have pictures of that. I like when people freak the hell out when you turn off the red emergency switch at the top of the stairs... NO!! That turns off the gas to the whole house!! 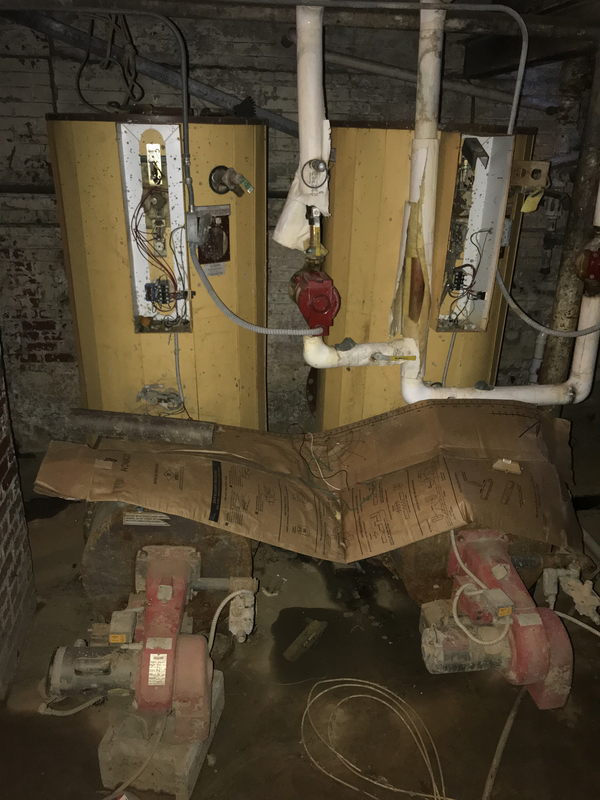 There were some after market kits around here that put a blower on top of the furnace. 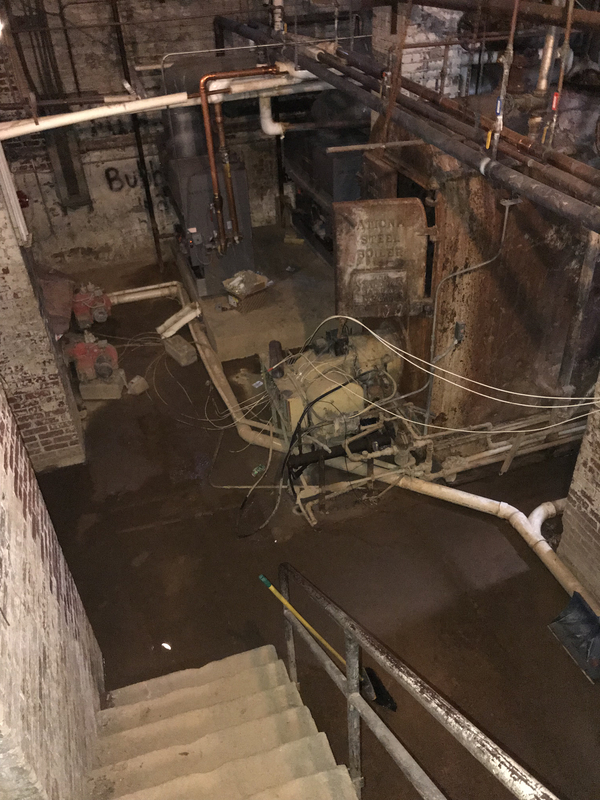 The shaft came out of the top dome and the motor and belt were exposed on the top. Some return air ducts were underfloor tunnels with wood box drops from the perimeter of the house.....lined with concrete or maybe dirt. Filters for dirt and dust?....the entire planet is made out of this stuff, this was so much cleaner than wood/coal stoves in the living area. For these the furnace set on top of the RA plenum. All supply ducts were on the inside central walls. (These make excellent large RA grills for upgrade to new FAF, no cutting in the existing house. Only add SA registers to perimeter. Even after FAF became the standard it took at least 20 years for the trades to reverse the locations of RA & SA. (around here anyway). Old habits die hard. I still question which is ultimately more cost effective. 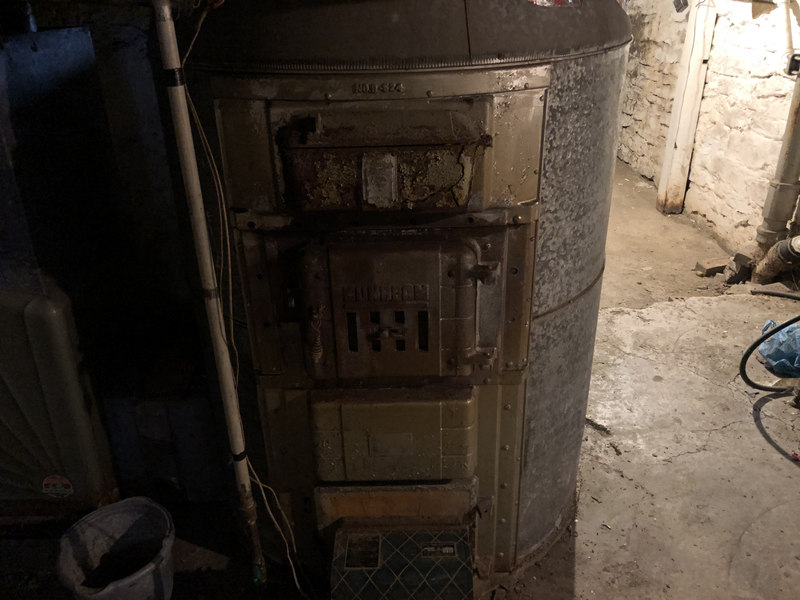 An efficient furnace / boiler that you need to replace every 10-15 years, or one of the old "unbelievably efficient" ones that lasts 80-100 years. The cost of replacement isn't small. Anyone have some numbers handy? @RayWohlfarth Did you ever have a customer say they didn't want to change something, like the picture above? Only to place blame with you weeks later, saying, "you should have changed it when you were here last time or this wouldn't of happened." It is indeed a “conversion blower” that sits on the floor in-line with the return. I believe the brand is ‘Viking’ or something along those lines. It even has filters believe it or not. The burner is a Gordon atmospheric that used to be millivolt with a Baso switch, but was at some point changed to a modern 24v combo valve. It is burning around 120k BTU/hr based on a quick meter clocking. The plan is to yank it out eventually and do a cast iron boiler/hot water system since the ductwork is rather sad (and asbestos-wrapped). I'ld replace the melted controller on general principles. But thing is it'll likely work fine for years. Technically the PC board can structurally stand up to heat very well. Seems only the cosmetic protective plastic cover shrank and warped. 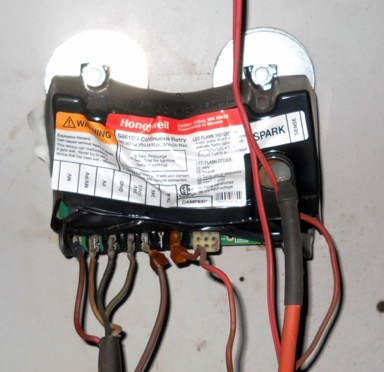 Seems only issue is did cover try to pull off any components as it warped, and are 120 Volt wires now exposed. However plastic components (relays) under cover may have warped too. @JUGHNE I think I saw 1 top mounted blower once. A lot of the 1950s small ranches built around here had supplies on the inside walls and returns on the exterior. Returns were always panned so every penny counted. The other thing around here in the 50s was aluminum ductwork made with long sweeps. Somebody told me they called them railroad fittings. 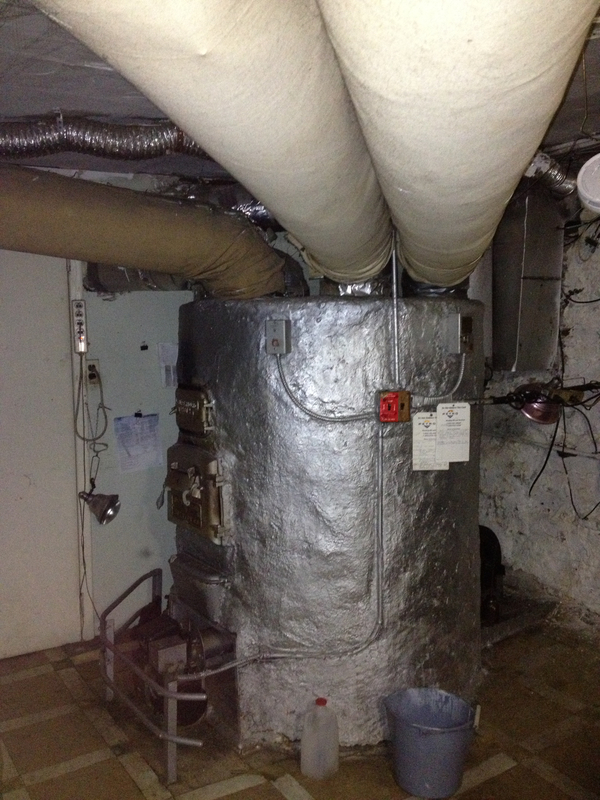 An efficient furnace you have to replace every 10-15 years. 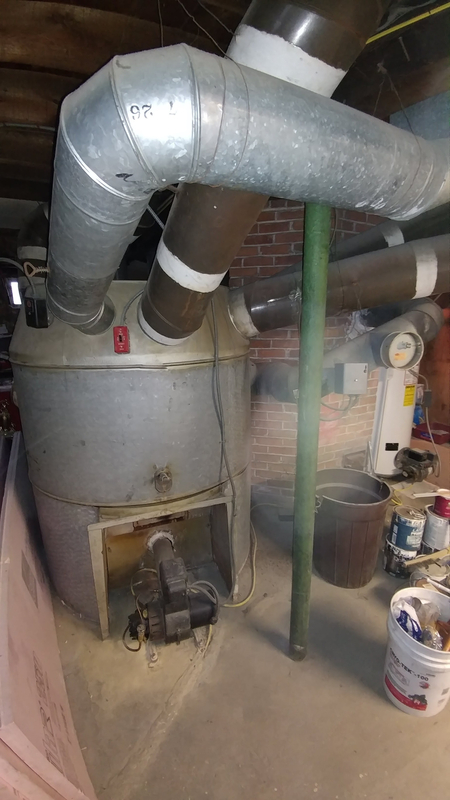 An average of 2200 gallons/yr @ $2.50/gallons=$5500/year *10yrs=$55,000 in fuel costs for the gravity furnace we just replaced. I was generous with the price for heating oil and didn't account for deep, long, cold winters. The ductwork is in place, I could buy several furnaces for $55,000. Looks like it will have used 700 gallons this [email protected] $2.50/gallon=$1750/year*10 yrs=17500. You have to look at the long picture. I was generous with the price for heating oil and didn't account for deep, long, cold winters. The ductwork is in place, I could buy a couple several furnaces for $55,000. Like I said. I've been curious, never said I was right. 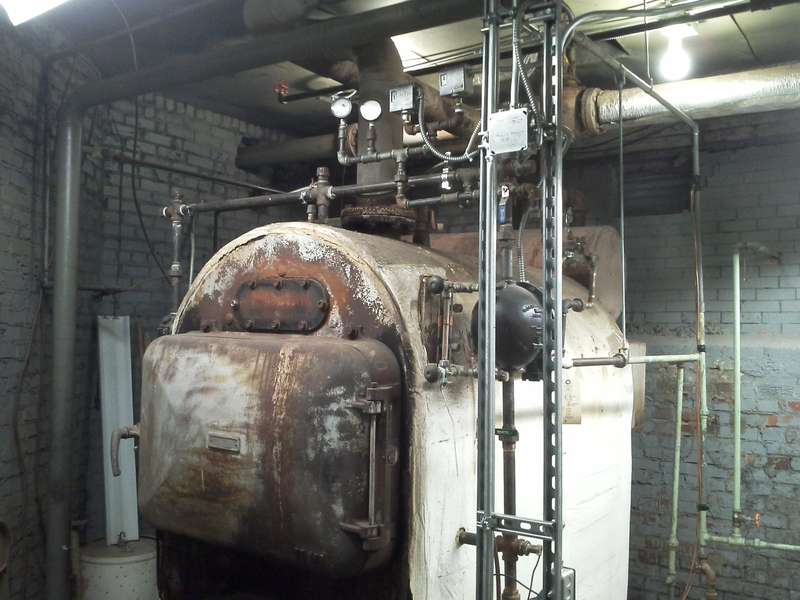 I've seen this large, old ,oil fired boiler, in a large 1900s apartment home. It was literally built into the brick wall! 3.50 or 5.50 gallon nozzle I think. Maybe even a dual nozzle setup. Can't remember exactly,but the cleaning access doors weighed more than Volkswagen. A little scary! You really feel the pain when oil prices are in the $4 range.